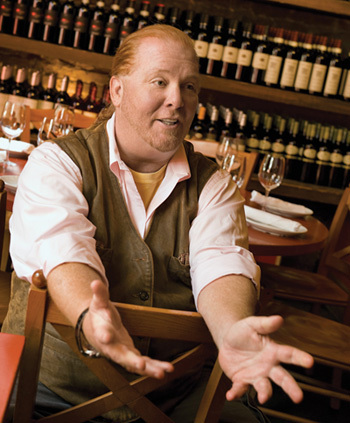 Mario Batali is perched at the far end of the long marble bar at Otto, his restaurant at the ritzy Greenwich Village address One Fifth Avenue, his “office,” at which he spends much more time than in his official one twelve blocks uptown. It’s late morning and he’s already breaking his personal “no sugar during the day” rule because the bartender has brought in a batch of lemon poppy muffins made by his daughter, so of course Batali must try one. He gently breaks it in half and offers a piece to his interviewer—“We share in our family, it’s all right,” he reassures—before digging into his half. It doesn’t take long before he’s ready to share a second muffin. Batali, famed restaurateur, cook (he doesn’t care for “chef”) and TV star, is wearing his signature baggy Bermuda shorts and orange Crocs. It doesn’t matter if he’s cooking with Martha (or Oprah or Rachael) or tootling around Spain with Gwyneth (Paltrow, his co-star in a popular 2008 PBS series), he’s always got bare calves and those clunky rubber shoes over socks. A vest over a shirt with rolled-up sleeves is also part of his usual style. He’s just as ebullient here as he is on TV. He’s no simpleton, as he very well knows, but he does have the role of an enthusiastic, comforting advocate for whatever he’s promoting, which is usually food. His hazel eyes actually seem to twinkle. 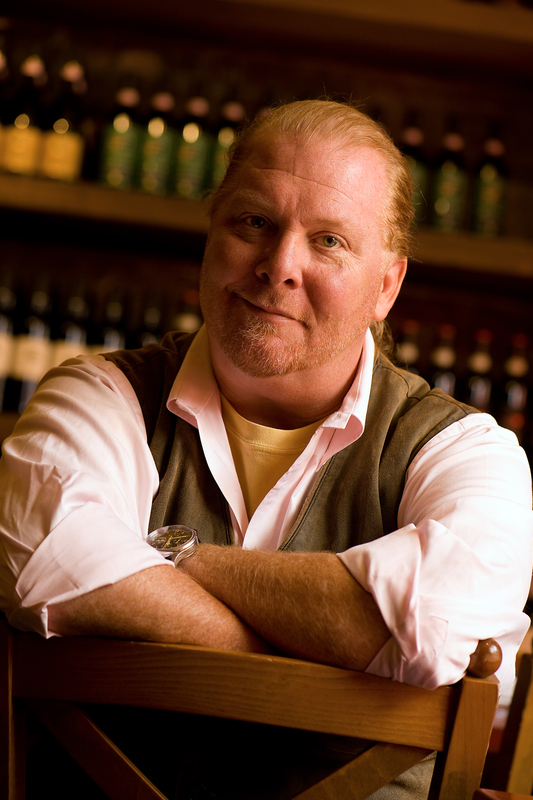 If Santa had a twin with red hair and a trim red beard, that would be Mario Batali. The orange motif of his footwear continues to the cover for his iPhone. He’s whipped out the phone to demonstrate one of his newest projects, a “Mario Batali Cooks!” app that’s part video cookbook and part travelogue, with screens that show photos and information about the spot in Italy where each recipe originated. A press release for the app says that Batali “personally created 100% of the content.” The way he expertly demonstrates and enthusiastically explains the features, that seems to be 100% true. He’s been making an effort to learn about new media, he says. “It’s an amazing thing how children are so interconnected. They’ll be my customers in five years, so I’ve got to figure it out.” In an old-media move, though, he launched his own in-house print magazine this summer, called Viaggio. Another new undertaking is Eataly, a 50,000 square foot marketplace at 200 Fifth Avenue that has quickly become a hot spot for New York foodies. Launched with Lidia Bastianich, her son Joe Bastianich, and Oscar Farinetti, it includes several restaurants, two of which he claims as his. That brings his total to 16, including eateries in Los Angeles, Las Vegas and Port Chester, NY. Singapore is scheduled to be added soon. He owns the restaurants, including his flagship Babbo, the highly regarded Del Posto and the amusingly named Spotted Pig, with his business partner Joe Bastianich. 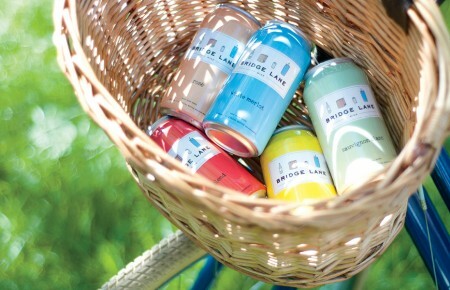 He’s considered opening a restaurant on Long Island, too, perhaps near his bayfront house in Amagansett. “I love Long Island. We usually go out there in May, for [wife] Susi’s birthday, and then we let it go to the tourists until September and October. We might do Thanksgiving there this year. I like it best when it doesn’t take five hours to get there.” (His own birthday falls on September 19, which he points out is Talk Like a Pirate Day. This year he turned 50.) Loving Long Island, however, doesn’t necessarily translate into working on Long Island. He laughs heartily at the idea because, really, he’s the opposite of that fantasy guy. Besides his many restaurants, Batali is likely to be visiting Jon Stewart, Jimmy Kimmel, The Today Show, a food festival or some other event on any given day. “Where’s Mario?” is an ever-changing page on his website, mariobatali.com. He has had several TV shows of his own, including Molto Mario, and has authored eight cookbooks and written forewords to others (i.e., his name has clout). He also makes breakfast every morning for his sons, 12-year-old Leo and 14-year-old Benno. Sometimes that just means pouring the cereal, he says, but often he’ll plan something more elaborate for them (while keeping his own intake light): Beignets for a special day, challah French toast for a school holiday or a dish he considers simple—whole wheat English muffin with a duck egg and ham and cheese. He also returns home for dinner every night with the boys and his wife Susi Cahn, whom he met when she was marketing goat cheese for her family’s business, Coach Farm. Batali also exercises every day, right after breakfast. Yes, Mario exercises! “I swim, I box, I do yoga and I play squash and golf. I do an hour a day at least, sometimes two hours. One of the things I find about managing stress is, if I really pump hard for 60 minutes a day, the stress kind of dissipates a little. It works for me. Even yoga. You can sweat pretty hard in yoga. It allows me to make better decisions.” He swims at a city-owned recreation center in the West Village that costs only $75 a year, he adds, but takes yoga classes privately. 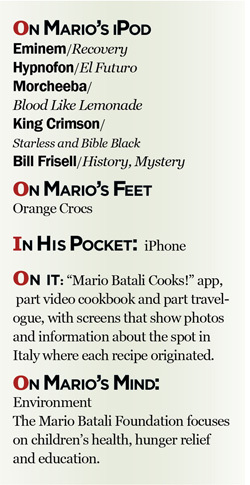 The real mystery about Mario Batali, though, might be how such a gregarious guy ever landed behind a stove. According to him, it came naturally as a result of his upbringing. And he learned that men didn’t just gather food. “When I grew up, it wasn’t unusual for the men to cook. It wasn’t unusual for everyone to be involved in the process of cooking, making something delicious. It wasn’t women’s work. It wasn’t in the back of the house, it was always in the middle.” They smoked their own salmon and made their own jam. “We put up fifty pies so we could have a blackberry pie every Sunday. We did all the jams, all the pickles, dilly beans, all this stuff. We were not obsessed. It was just part of our lives. Batali’s father worked for Boeing and his mother was a registered nurse. When he was in high school, Boeing sent his father overseas. 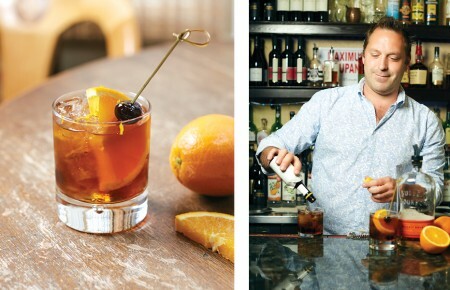 “We moved to Spain and that further underlined the potential for deliciousness. Even though Spain was not ready for gastronomic primetime, it was good, it was interesting. But they were still burning the garlic in the ‘70s. Now they’re much more chic,” as he demonstrated in his PBS series with Gwyneth Paltrow, Spain…on the road Again. After he graduated, he enrolled in Le Cordon Bleu, the renowned culinary school in London, but soon got bored. “I dropped out of it and worked for a guy named Marco Pierre White, who was the enfant terrible of our generation. And then I worked in a bunch of restaurants and landed here in New York in 1992, where I fell in love with my wife, opened my first restaurant in ’93 and got married in ’94.” The “bunch of restaurants” he worked in included a little trattoria in the mountains of Italy near Bologna called La Volta, where he learned to make pastas and sauces in an authentically Italian way. How he came to New York is a roundabout story. “I was actually on my way to Brazil from Turkey and I stopped in Florida, where I ran into an old college roommate. His father owned a place called Rocco on Thompson Street. I came here to run it. That partnership didn’t quite work out, so I started my own restaurant, Po. I sold it to my partner, Steve Crane, in ‘98, and it’s still there and doing well.” That same year, 1998, Batali opened Babbo and launched his present line of restaurants. Even when his restaurants were in trouble, he didn’t cut menu prices, which he says are low anyway, with a top price of about $16 at the casual Otto Enoteca Pizzeria, where we’re sitting, and $29 (with a couple of exceptions) at nearby Babbo. It’s all about value, he says.